Home / Entertainment News / PHOTOs of OKOTH OBADO’s son, wife and daughter, his daughter is SHARON OTIENO’s age-mate. 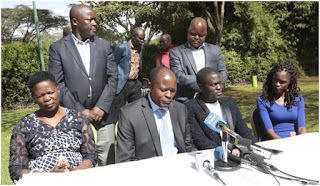 Thursday, September 13, 2018 - Embattled Migori Governor, Okoth Obado, called a Press Conference at Serena Hotel where he set the record straight on allegations that he plotted the murder of a 26 yr old University lady called Sharon Otieno. Okoth denied any involvement in the murder of Sharon and accused Kenyans of crucifying him yet he had nothing to do with the grues0me murder that shocked the nation. He was accompanied by his wife, Hellen, his son Jerry Okoth and daughter, Evalyne Okoth. It’s interesting to note that Okoth’s daughter, Evalyne, is the agemate of his late mpango wa kando, Sharon Otieno.